"There were real superheroes, of course. They did exist. They lived in paper universes, suspended in a pulp continuum where they never aged or died unless it was to be reborn, better than ever, with a new costume. Real superheroes lived on the surface of the second dimension. The real lives of real superheroes could be contained in two hands. They were so real they had lives that were longer than any human life. They were more real than I was. 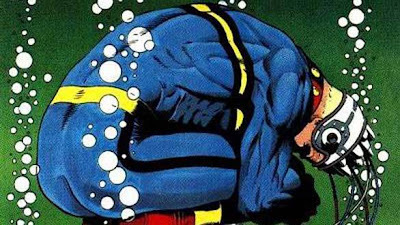 They say most human names and biographies are forgotten after four generations, but even the most obscure Golden Age superhero is likely to have a life and a renown that will last as long as trademarks are revived." I was just talking about Superman as tulpa this weekend.